Born in Gloucestershire in a family teeming with musical talent, James soon became obsessed with singing and writing songs with his older siblings. With a strong influence of classic progressive rock and modern metal coursing through much of his early years it wasn’t long before James picked up a guitar and strummed the first chords of Deep Purple’s classic, Smoke on the Water. Further education saw James take an interest in in Music Technology. Excelling in Performance and songwriting modules led to his debut solo album, “The Minds Eye”; a beautiful blend of modern electronica, soaring vocals and pounding guitars that earned him a 2:1 with Honours from the University of Hull. 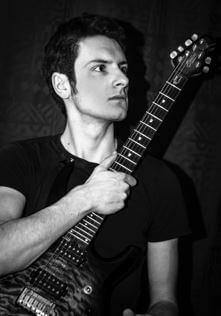 It was whilst studying for his degree he joined progressive metalcore outfit, Elements, as bassist successfully gigging around the North East and recording music for over 2 years before eventually leaving in 2012. Porcupine Tree, Genesis, Riverside, Dream Theater, Led Zeppelin, Pink Floyd, OSI, Anathema, Baroness, Tesseract, Cloudkicker, ELP, Iron Maiden, King Crimson, Ozric Tentacles, Tool, Queen, Symphony X. Music Man JP100, Ibanez RG270, Hughes & Kettner Attax 100, Marshall MG50, Boss DS2, Zoom 505II FX, Behringer HB01 Wah, Behringer Chromatic Tuner.